A.M. Naik: Why is this man splitting L&T? Come October 2012, A.M. Naik, if all goes by his plan, will start writing a memoir. The impatient man he is, the Chairman and Managing Director of Larsen & Toubro has it all planned out for his post-retirement days. "One hundred and fifty requests have come to me to write a book," he says with no hint of exaggeration. "It will be titled 'V to W'. Village to World." Naik flaunts his years of growing up in a village like a general his scimitar-and-baton insignia. When he was in Class Five, Naik's father, a high school mathematics and science teacher and Gandhian, shifted from Mumbai to Kharel in southern Gujarat. "And suddenly from an elite school, I came down to a floor; that, too, a gobar (cowdung) swept floor," he says, this time a smile pushing against ample jowls. The story of Naik, born in June 1942, third to his parents after two girls, is one of hard work, luck, leadership, ambition and shrewdness - all in enormous measure. Attributes that helped the boy who "thought in Gujarati and translated into English" race to the top of one of India's most-respected conglomerates, which even today is among the few professionally-managed, board-run and widely-held companies in a $1 trillion economy. One that, after he became CEO in 1999, has grown from revenues of some Rs 7,400 crore to Rs 46,800 crore - ranked sixth in India if governmentowned behemoths are not counted. Why then is the 69-year-old Naik risking all that he has built by throwing L&T into a restructuring whirl that will effectively split it into nine entities? Nine "virtual companies" saddled with too many businesses - L&T runs 152 - with too thin a senior management to run them. Businesses that cannot attract the best talent in a country where the brightest engineers emigrate to the West or choose better-paying software jobs. Businesses that will benefit from new-found flexibility and independence, to be sure, but will miss the benign shadow of a thriving Engineering and Construction business that generates about 85 per cent of L&T revenues. Especially if they are spun off and listed on the stock markets. All this gut-wrenching change has to be carried through with just 18 months left on Naik's and key members of his core team's watch. In an interview that runs for nearly four hours, Naik is at his combative best. But, even he has to agree that L&T has become increasingly unmanageable in its scale and scope (See Spreading Itself Thin). "You (L&T) have stretched yourself beyond limits to get to (Rs ) 50,000 crore (revenues) without changing your earlier structure," he says. To illustrate, he says the L&T board today has just eight executive directors despite the company's size - down from nine in 1977. 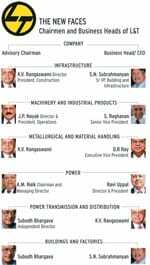 To add to L&T's troubles of a complex structure, some of Naik's most trusted lieutenants, who have been by his side for decades, retire over the coming quarters. Director J. P. Nayak retires on March 31. K. V. Rangaswami, Director and President, Construction, is set to retire in June. Directors K. Venkataramanan and V. K. Magapu retire in mid-2012 and early-2013, respectively. The retirement age for directors at L&T is set at 67 years, and 70 for the chairman. Then, L&T faces the tough task of pulling in competent hands to man advisory boards at each of the nine new, proposed virtual companies. With three external members and one non-executive chairman needed for each of these boards - designed to set goals and monitor each entity as a board of directors does with the CEO of a company - Naik needs to spot, cajole and bring in 36 topflight professionals almost overnight. The first thing I did was to create a new vision, a new strategy and therefore bring in one or two of the top three strategy firms to resolve issues that were inherited. That was keeping me occupied. The second strategy is to study once we had implemented this, what is the L&T score. Study the various businesses and put them in buckets. 'Small and totally non-core' like glass bottles, leather shoes. Please close if you can't sell…Second, 'too small and cannot grow' and heavily dependent on foreign technology. And 'non core but grow to sell'. That's what I did with cement. You have to create a company within a company such that it runs like a listed entity and is ready with a governance structure, with a proper understanding of a CEO, and know how an external board member behaves, how does he has to manage the board. So we have three external people in each of the boards and one parent company non-executive nominee - and each one of them has been told to run this 'virtual' company and bring it to a level of maturity where the parent can trust them to spin it off so that it does not spoil the name of L&T… We are trying to simplify L&T and make it worthwhile to compete with the gorillas of the world. L&T is not one company, it is 25 companies. Can it be run by a single man? People tell me you have not left a successor. I tell them, you find a man in the world who will kill himself four times a day, has worked for more than a hundred years, started more than 60 per cent of the company himself with devotion and passion, and not bothered about his own family. The day you find such a man he is my successor. So what should we do? There is no such person. And therefore you cannot run L&T as you ran it before. If we don't do proper restructuring a lot can go wrong, therefore we have to make it work. So we have to work day and night, relentlessly, and make sure we do everything, think and reinvent to suit the individual businesses to be run in the best possible manner in the industry and be oneup against them… Simplicity-wise the task is undoable. The easiest answer to tell you is it will take five years. But that task is not easy even if the L&T head says he spends nine hours of his 14-hour workday on the restructuring and interviews 10 people a week. Naik was trying to hire a CEO with international experience to take charge of L&T's machinery and industrial products 'virtual company', run by Nayak today, and housing businesses from industrial and construction machinery to rubber machinery and valves. "It was 11 strategic busniess units, SBUs, rolled into one and he had handled only one business in the past," Naik says. But the candidate was clear that he had run a bigger brief in the past and was disinterested. An unstated problem is that of the largerthan-life personality that is Naik, whose pugilistic visage and bluster to match can be unnerving if you have not known him for years. No one will go on record on this but one company executive, who has worked closely with the chairman, says, "There is a strong sense of 'I' with A.M.N. (as Naik is referred to internally). Other directors feel left out at times." This is a view that runs strongly through L&T - and during BT's interview with Naik - though several in the company also point out their chairman is warm once he gets to know you well. Perhaps. But until top external candidates get to know that side of Naik - industry gossip has it that Ravi Uppal, a high-flier from ABB lured to run L&T's power business and widely seen as Naik's successor, has gone low profile as proof that only one person can be the face of L&T - the conglomerate will face a problem of empty senior slots. Such empty slots mean double-staffing for several faces, for now (See L&T's New Faces). S.N. Subrahmanyan, a senior vice president heading building and infrastructure business for L&T will also run the buildings and factories virtual company - in addition to replacing Rangaswami on the L&T board of directors on July 1. Rangaswami, the retiring director, will be the advisory board chairman for the infrastructure as also the metallurgical and materials handling virtual companies, and also will don the CEO role in the power transmission distribution business. Ditto with at least four others who will have dual roles. This can mean cutting corners in the management bandwidth required to carry a restructuring of this size through. "The start and end points of restructuring are defined. The effort taken to execute this is usually underestimated," says Chaitanya Ramalingegowda, a globalisation specialist at Zinnov Management Consulting. 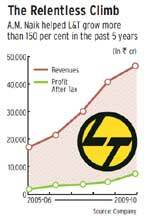 Still, despite the uncertainty that has shaved off 22 per cent value from L&T shares between January 5, when the restructuring news became public, and March 23, there is no doubting that L&T is a well-oiled machine that generated Rs 5,308 crore in net profits in the 2009/10 financial year and as of December 2010 had an order book worth Rs 1.14 trillion (one trillion is 100,000 crore). Operating profit margins are at a healthy 13.5 per cent and debt gearing low at 0.35 times equity. Delivering this level of performance is a close-knit team of top managers. At its forefront is Nayak, an old timer. At his industrial, no-frills style office in the Powai suburb of Mumbai, the scribbling on a white board shows why Nayak is key to Naik's transformation plans for L&T. "Set to achieve 2015 targets, Rigorous implementation of 2015 roadmap, and Initiatives in each (virtual company)," the bullet points read. Quizzed on such four-year planning, Nayak says, "We will change the constitution of the company from an operational company to a hybrid holding company." The retention of directors such as Nayak and Rangaswami in the L&T system as advisory board chairmen may seem mild transgressions of corporate governance ethics - will the company be run by old timers who have retired from the board of directors but stay on in advisory roles and wield power? - but management consultants see it as a positive for the company. "The successive restructuring is a huge mammoth exercise. Having continuity always helps," says the India head of a top global consultancy firm, requesting he and his employer not be identified. In 2007/08, L&T had tried to put in place internal management committees to help run each division with flexibility and independence. That structure fell by the wayside because, defends Naik, the demand for L&T's services and products was expanding so fast that the company risked missing growth if it paid attention to fostering the committee-led structure. When asked about the directors staying on in the company, and the possibility of him doing so too, Naik is a little vague at first. "Now we are on the final lap, where everybody knows that they will have to play the transitional role: choose the right board and the right CEOs, make the companies independent, and transit out as early as possible," he says. "We are trying our best for September 2012, but if that means not only me, if that means J. P. Nayak has to work six months longer, he will." Towards the end of the interview, Naik is slightly more direct: "September 2012, that's my term and it ends," he says. Unlock value from fair-size business such as L&T Financial Services, where an initial public offer is planned. Director Deosthalee will shift as its chairman and managing director after listing. Career: Should you follow your old boss into a new company? How disaster-ready is India Inc? All this - and this is just one quick peek into the complex agenda before L&T - even when it keeps its growth engines running. "L&T is a projects company. It should be very careful what happens to the operational structure," says Satyashri Mohanty, Founding Director of Vector Consulting Group, which counts Godrej & Boyce and Tata Bluescope among clients. This operations focus is critical for the Rs 20,000 crore investments that L&T has made in power, financial services, defence, and oil and gas, to pay back. L&T and its 38,000 employees, in other words, need Naik more than ever before. Says Gautam Adani, Founder-Chairman, Adani group of companies, and a close acquaintance of the L&T chief: "There will be a huge gap when he steps down. I feel he should continue for, say four-five years, in a nonexecutive capacity to groom the next leader." That may be needed, ironically, even to find Naik's successor because the board, says the head of a large finance house in Mumbai, looks up to him for direction in all matters. To ensure L&T's success - some would say survival, even - Naik will need to stay until the company's recast is successfully carried through. Even if that takes more time than when his term ends in September 2012. Which, sadly for the Indian corporate reader means that Naik's memoir 'V to W' will likely take longer than planned to hit the shelves.